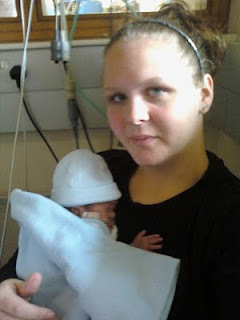 Abby is an inspirational young mum, that I have written about before. Her story of Luca's birth is an amazing one, and serves as a timely reminder that it is important for all pregnant women to have the flu vaccination, now that we are aware of the devastating implications of flu in pregnancy. 17 days. The age my Luca was when I set my eyes on him. Born at 27+6 weeks gestation he was left for over 2 weeks without a mummy, alone in this scary world. On Christmas day 2009, I was feeling very ill and weak. Late in the evening I collapsed and had to call an ambulance. I was taken to the delivery suite as baby wasn't moving very much. What happened that night is still quite blurry but I remember having a drip in each hand and the doctors being worried my oxygen saturation was edging to the 70's. By early morning boxing day a doctor came round and put me onto a portable cpap/bipap machine. I was told I would be transferred to HDU or ICU. The last memory I have is a mask being put over my face and being told that baby might have to be delivered. The doctors tried to keep Luca inside me but 2 days later on 28th December I deteriorated and he had to be born by crash caesarian in main theatre. He was ventilated and transferred to the nicu. I was put on the critical list and given 6 hours to improve or there was nothing they could do. Tests came back and showed I was positive for swine flu. This in turn caused double pneumonia and lung failure. The ICU team contacted Glenfeild in Leicester who run a specialist ECMO unit. A bed was found out of the 14 ECMO beds the UK has and I was transferred to The Royal Brompton in London. ECMO (extra corporal membrane oxygenation) is a heart/lung bypass machine used as a last ditch attempt when conventional ventilation isn't working. It is a very specialist treatment and the outcomes are still quite low. After 8 days I was taken off the ECMO and after a further 6 days I was taken off sedation and transferred back to my local hospital where Luca was. 2 days later I was transferred from ICU to Maternity where I FINALLY got to meet my baby boy. Whilst I was absent Luca went from strength to strength. He was off ventilation and onto cpap which he spent a further 6 weeks on. He was then put onto lo-flow oxygen until 6 days prior to discharge. He had a very smooth ride in comparison to some of our fellow NICU families and was in for 71 days. It will be 2 years this Christmas since all this happened and Luca is a happy and loving little boy. 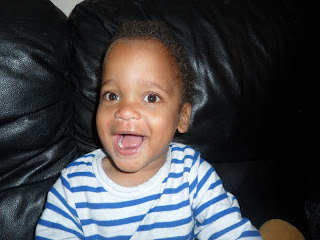 He has had a few re admissions and suffers with asthma now but doesn't let it stop him. I am forever grateful to the doctors and the nurses in NICU who looked after Luca and to all the doctors and nurses who looked after me in ICU. Wear purple today and take a few minutes out of your day to think about the families affected by prematurity. Wow, what an amazing story with a happy ending. Abby is just amazing. It's incredible what she has been through, and she's such a fab mummy! Wow, amazing journey, and what a gorgeous little boy. This gave me goosebumps! Thank goodness you are okay! So glad it was a happy beginning and not a very sad ending. You must feel so blessed. Makes me appreciate everything just that little bit more. Thank you for sharing.